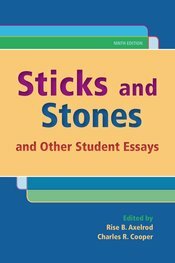 This unique collection of essays written by students around the country offers diverse and accessible models for the writing assignments in Part 1 of The St. Martin’s Guide to Writing. The chapters in Sticks and Stones correspond to the chapters in Part One of the Guide. Packaged free with the Guide.